Wine tasting is a fascinating pastime that engages all the senses. Don’t let it be intimidating or overly complicated. We’re removing the stigma surrounding wine, showing you that it can be a fun endeavor, whether you’re an expert or a beginner! 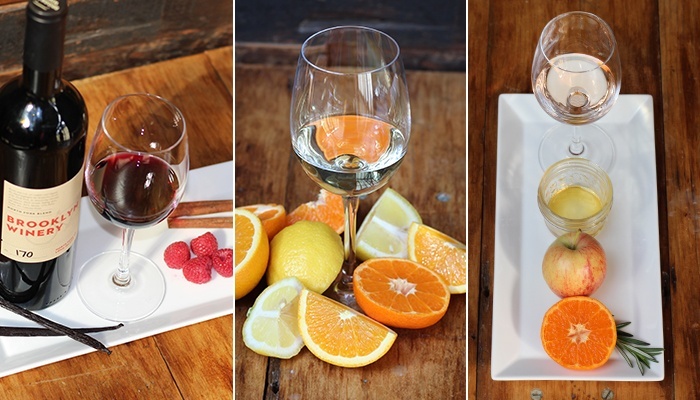 We’ll walk you through some basic steps and vocabulary of wine tasting to get you started. By thoroughly engaging in the whole tasting experience, you can elevate your enjoyment of wine even further, and that’s what we at Brooklyn Winery love to see! Wine tasting is about being in the moment. Slow down and focus on your senses: sight, smell, and taste. 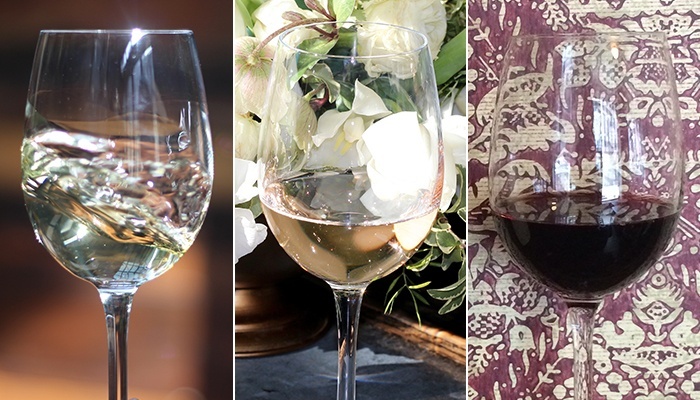 First, take a look at the wine in your glass; you can learn a lot from a brief visual examination. There are three things to look for: color, opacity, and viscosity (often called “legs”). The color and opacity will give you an indication of the age of the wine and grape variety that you’re dealing with. 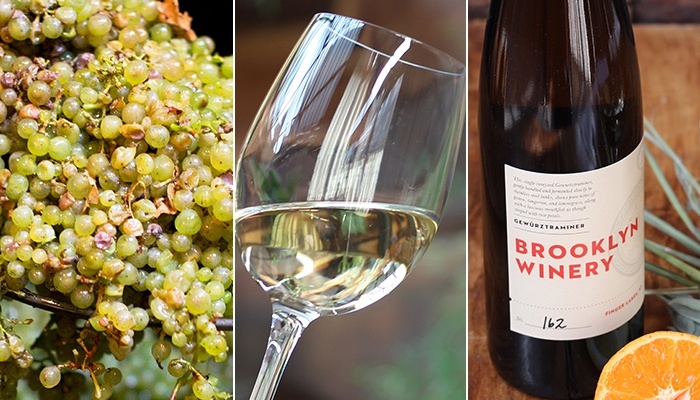 White wines become more yellow and increase in pigment as they age. Red wines lose color and become brown or brickish the older they get. The viscosity of the wine can give you an idea of its alcohol content. Give your glass a swirl—as the wine drips down the sides of the glass it will leave behind “legs;” this is most notable in fortified wines or a high alcohol wine like an Old Vine Zinfandel. The slower the wine flows down the side of the glass, the more viscous it is, meaning the alcohol content is higher. Climate also plays a role in the color of the wine. Grapes from a cool climate tend to be thin-skinned. Since color is derived from the skins, a thinner skin means less surface area for potential color extraction, leading to light red wines, like an Oregon Pinot Noir. The opposite is true for warm climate grapes with thicker skins, like a bold Sonoma Cabernet Sauvignon. Now that you have an idea of the age and alcohol content of the wine, you’re ready to move on to scent. Begin by tilting the glass and bringing it up to your nose. 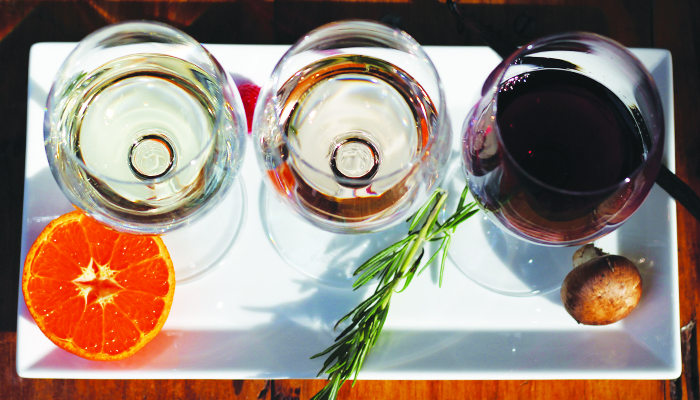 Think about what you are smelling: notes of citrus, floral hints, or perhaps earthy mushroom or a subtle minerality? The aromas in wine can tell you a lot about the varietal, aging techniques used, vineyard location, oak treatment, and so on. It’s easy to get bogged down in terminology when describing what you’re smelling but, remember—there are no wrong answers! To help simplify this part of wine tasting, let’s break the aromas down to three categories: primary, secondary, and tertiary aromas. Primary aromas derive from the grape variety and growing region. This is where you’ll detect fruit, herbal, or floral notes—like the scent of rose petals detected in a Finger Lakes Gewürztraminer. Secondary aromas are produced by the fermentation process. Any bread-like aroma is a result of the yeast used in the fermentation. Lastly, the tertiary aromas come from the aging process. This includes any oak treatment, which can produce different aromas depending on the oak used, like vanilla from French oak or cocoa from Hungarian oak. As wine ages in the bottle, it continues to change. A young wine presents more fruit on the nose than an older bottle, which can exhibit more concentrated and earthy components. Smelling the wine offers plenty of hints for flavor, allowing you to move on to the most exciting part of the wine tasting process. It’s time to take a sip! Focus on four main characteristics: sweetness, acidity, tannins, and body. As you sip, gently swish the wine around your mouth so it coats your tongue. This is essential, as different parts of the tongue detect different flavors and characteristics. The tip of the tongue detects sweetness. So if a wine is dry, it means there is no residual sugar, thus you shouldn’t taste any sweetness. The sides of the tongue detect acidity and produce that mouth-watering sensation. A wine’s acidity can reveal clues about the grape varietal, climate, and aging potential. Tannin is described as the drying sensation in your mouth when you drink wine. There are two kinds of tannin; grape tannins are found in the skins, seeds, and stems of the grape. Oak tannins are softer and smoother and—you guessed it—derived from oak. Wood tannins typically present more on the tongue, whereas grape tannins are more likely to dry out the front of your mouth and teeth. The body has to do with alcohol content and texture of the wine. This is where you determine if a wine is light, medium, or full bodied. Wine with a higher alcohol content will be more viscous, it will feel “heavier.” By keeping these four aspects in mind as you sip, you’ll begin to understand the wine on a more complex level, ultimately making it more enjoyable! Using the information you’ve gathered through your senses, you will develop a profile for the wines you taste. The most important question to answer is, do you like it? After that, consider were all of the components in balance? What sort of food would you pair it with? By using your senses of sight, taste, and smell, you can determine everything you need to know about the wine, from the origin of the grapes, the weather the year they were harvested, the aging style, and everything in between. Wine tasting, beyond being simply enjoyable, is like putting a puzzle together, which is the reason so many of us are enchanted and keep coming back for more!